One purchase protects desktops, laptops, smartphones or tablets! Whenever you’re online, your personal and financial information is open to keylogging attacks. Keyloggers can record every keystroke you type on your computer, smartphone or tablet. Every password, every credit card number, every message … EVERYTHING you type. Hackers can infect your device without you knowing. Emails, videos, music files, software downloads — even legitimate websites and your favorite social sites can unleash a keylogger. And most cyber security experts agree that anti-virus programs now catch only 20% of “known” threats. Worse, anti-virus offers no protection against new, “zero day” attacks. GuardedID® and MobileTrust® proactively protect your information against keyloggers, even zero-day attacks. StrikeForce combines military-grade keystroke encryption with other must-have security features to give you complete peace of mind when using your online devices. With GuardedID® and MobileTrust®, if your device is infected, you’re still protected. Shop and bank online without revealing your credit card numbers, usernames, passwords or account details to keyloggers. Keep what you type in emails, text messages and documents out of the hands of cyber predators. Securely type your Social Security, health and other personally identifying information. Keyloggers are designed to do one thing — steal every keystroke typed onto a keyboard. StrikeForce patented anti-keylogging technology outsmarts cyber criminals. 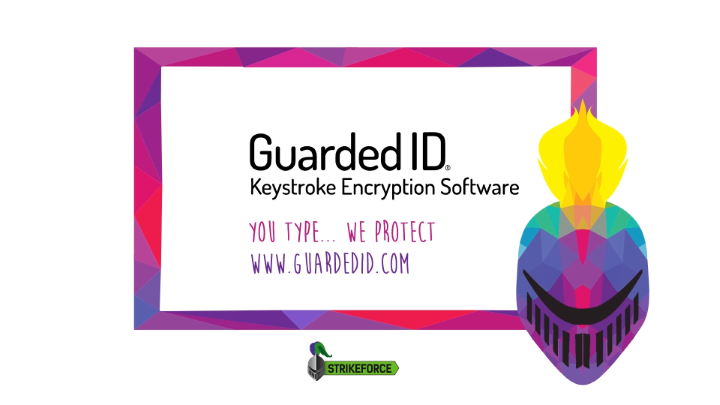 It encrypts your keystroke data and creates a safe pathway from your keyboard into your computer application or mobile app. StrikeForce has made its solutions available to corporate customers and now — thankfully — the company is taking it directly to the individuals who need the protection the most. GuardedID® needs to be on every computer.